Elise’s Swissness (what a tongue twister) is hard to pinpoint, maybe because it has been partly obscured by her London years (or her years in Barcelona or New York). Since she moved to Berlin a couple of months ago (after we both had spent some time in the waltzing city of Vienna), I have become aware of an accumulation of Lausanne expats that seems to be constantly hosting lovely dinners or performances consisting of picnics and sunny afternoons. Elise seems to be immediately surrounded by a large gang of fabulous friends and collaborators in every city she goes. She is a freelance curator, artist, writer – in itself an act of constant defiance against the forces of economics and pragmatism – and is one of the most productive people I know, despite or maybe because of the dinners and picnics. Collaboration and communal thought are at the centre of her endeavours. She is massively committed to her work, to people, ideas, and I hugely admire her sensibility. She gets up at ungodly hours in the morning and makes poker-face fun of me sometimes for being constantly anxious. Once she told me about a conversation she had with an ex-lover in the bathtub that changed her life, because she realised that she could be whoever she wanted to be. Since March 2014, Elise Lammer is artist-in-residence in Marfa, Texas. Together with French artist Pauline Beaudemont, she is currently conducting a research on the city’s mystic and subconscious history. She also plans to kill an old pair of Chelsea boots while hiking through the desert. Last night I came back to Berlin after a month of mundane travel — London, Rome, New York, and finally two days with my family in Westphalia (a location I mainly mention because Christopher described 60pages’ interests as seemingly gravitating toward West Germany). (His exact list of prevailing topics was: “Wien, Delhi, LA, Lichtenberg, Fußball (und auch Kochen) West-Deutschland, Musikschule“). At 1:24 in the night I woke with a jolt and stereotypically had the urgent realisation that I didn’t know where I was. I searched the night-grey room for anchors of recognition, trying to fit a New York stencil over the sketchy abstract wispy grey forms I couldn’t quite interpret (which much later turned out to be the withering willow next to the bed and its shadows thrown onto the amorphous wall by the array of Berlin street-lights at eye-level outside the windows). The way my mind was flitting through the room trying to find its bearings reminded me in a sleepy epiphany of something I had seen a few weeks ago in Cambridge. After the shock of dislocation subsided, I dreamily fixated on this flash of an idea which solidified into a note I soporifically somnambulated into the ugly Notes app on my phone. 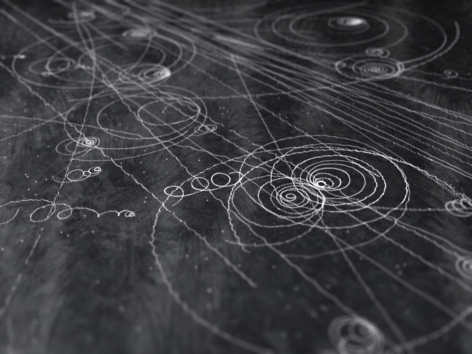 The Cavendish Laboratory owns the first and only so-called cloud chamber built by its inventor Charles Thomas Rees Wilson in 1911, subsequently known as the Wilson Chamber (an object I naturally adopted as my totem apparatus). The Wilson Chamber is a device to track the paths of flitting, flirting, unstable particles through supersaturated vapour, leaving trails of indecision, collision, pirouettes and nervous elopements. In the frenzied attempt to fill the nebulous void with charged forces, the particles ionise the hazy mixture. Lightweight methanol vapour saturates the chamber, the alcohol falling as it cools down and the cold condenser providing a steep temperature gradient. Alcohol vapour condenses around ion trails left behind by the travelling ionizing particles. 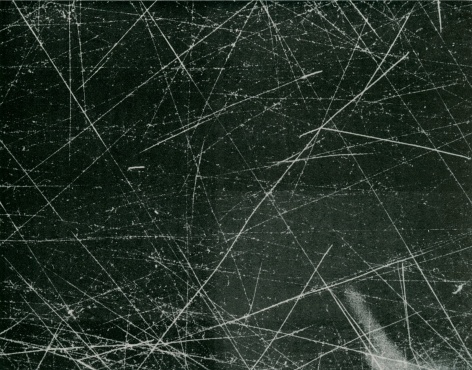 Clouds form, visible in the cloud chamber by the presence of droplets falling down to the condenser. 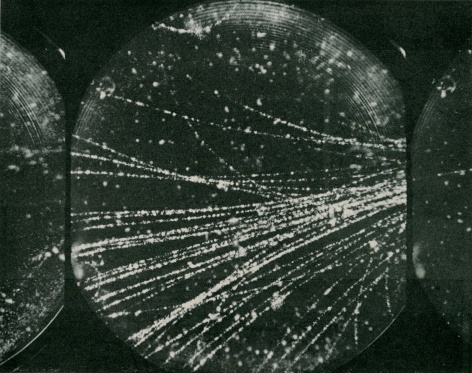 As particles pass through all they leave behind are ionization trails. My nocturnal self added behind this vaporous thought a quote by Ernst Jünger that I had heard on the radio the same day: “Mein Gegner ist die Sprache” / “My enemy is language”. I can’t retrace the logic behind this association — I think it had to do with leaving linguistic traces in the thick mist of a medium whose enmity you can only express within it, enclosed in the cloud chamber of language. When I woke up in the morning the sun was shining.